We didn’t plan to visit Battambang, Cambodia. We had booked an early bus out of Phnom Penh to the border town of Poipet. The trip was a disaster from start to finish. We had the misfortune to be seated in front of a very disturbed Khmer man who kept reaching between the seats to grab my side with his filthy hands. His fingernails were black. He kept sucking his teeth and making an irritating smacking sound. We thought he looked like he might be on yaba (speed) as his behavior was very erratic. His seatmate was trying to lean as far away from him as possible. The bus was completely full so there was no possibility to change seats. At the first stop, a single seat opened up in the back of the bus and the creeper’s seatmate ran for it. We weren’t so lucky. I stayed leaned forward in my seat so that his hands could not reach me. Then he started touching Micheal’s side. This guy looked really off and I really didn’t know what to do. He really looked like he might explode with rage if confronted so we did our best to ignore him and avoid his hands. After what seemed like an eternity but was probably about an hour and a half, the bus stopped again and two seats opened up at the front, freeing us from the crazy man. We settled into our seats and thought that we would now be able to catch some sleep. Wrong. The bus broke down and we sat in the sweltering heat for 3 hours at a tiny roadside stand waiting for a new bus to be sent. Okay, fine. It wouldn’t be a trip to Cambodia without a bus from hell story. The new bus arrived but now we were really behind schedule. I didn’t want to arrive in Poipet after dark as we had no idea what the place looked like or how far it would be to the border. I asked the driver if there was a possibility to get off in Battambang but he told us no, that the bus would not stop. He seemed irritated. The bus did stop in Battambang but we had to convince the driver to actually open the luggage compartment and let us get our bags. I’m not sure what his problem was. It was now after 10pm, so we chose the hotel closest to the bus station, Asia Hotel. The rooms were nice and there was a swimming pool so we decided to stay for two nights. 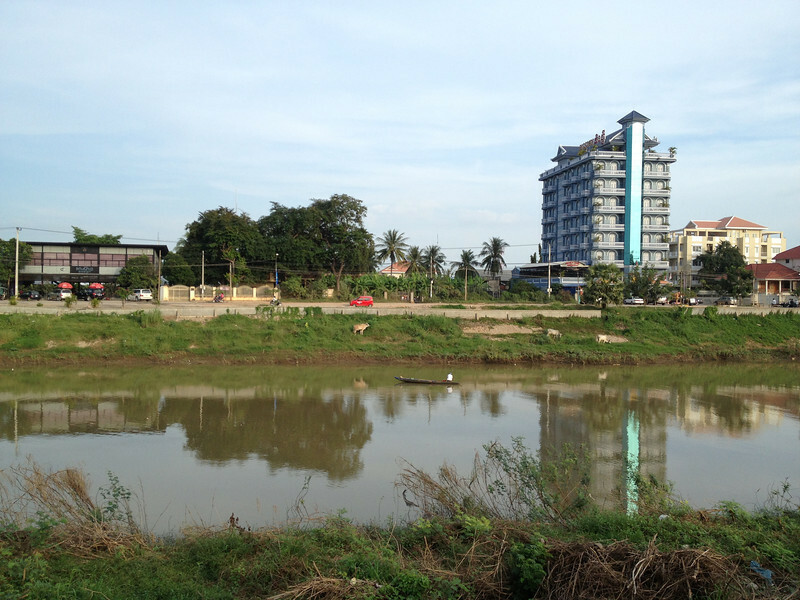 The Sangkae River in Battambang. Battambang is the second most populated city in Cambodia but it is much more relaxed than Phnom Penh. You can cover the city centre on foot and we only used tuk tuks when going back to the hotel at night. There are several temples in the area and of course the Bamboo Railway but we chose to only explore the city centre and use the chance to try some more Cambodian cuisine. It was late by the time we checked into the hotel and we didn’t want to venture too far away since we didn’t know the layout of the city yet. We stopped into the first restaurant that was still open. This was a small place, I could see the owner’s bed through a doorway in the back. His wife sat nursing a small baby. 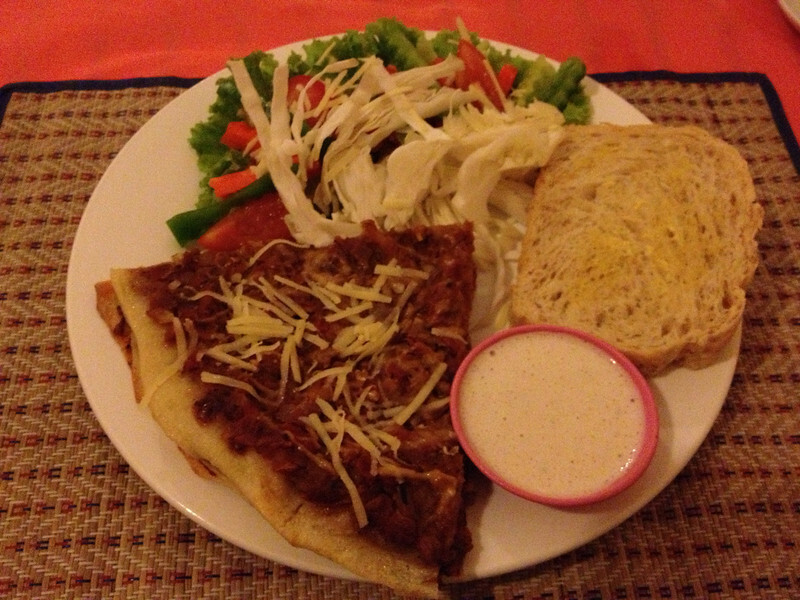 Strangely, the menu was filled with Western dishes and nothing Cambodian. We had no idea what to order. This certainly didn’t look like a place that could make the listed lasagne or cottage pie. We wondered if the food was made elsewhere and this guy just heated it up. We decided to order both out of curiosity and not wanting to go in search of another open restaurant. The owner spent a long time in the kitchen, rattling pans. Now we were very curious. I had expected to hear the sound of a microwave heating up a pre-prepared meal. After about 45 minutes, I was presented with the dish pictured above. My “lasagne” was a strange concoction of baked bread, a mystery meat and something that resembled cheese but did not taste like it. The plate presentation was lovely. I’m sorry to say that it was terrible when the owner had clearly gone to a lot of trouble in making it. I took as many bites as I could and tried to arrange the contents of my plate so that it would appear that I had eaten more. Micheal, always polite, managed to eat most of his version of cottage pie. Finally, I gave up and we asked for the bill. The owner looked disappointed and asked if there had been something wrong with my food. Micheal made some excuse about how I had not been feeling well and we left him a large tip. I really felt bad but there was no way I could eat that. 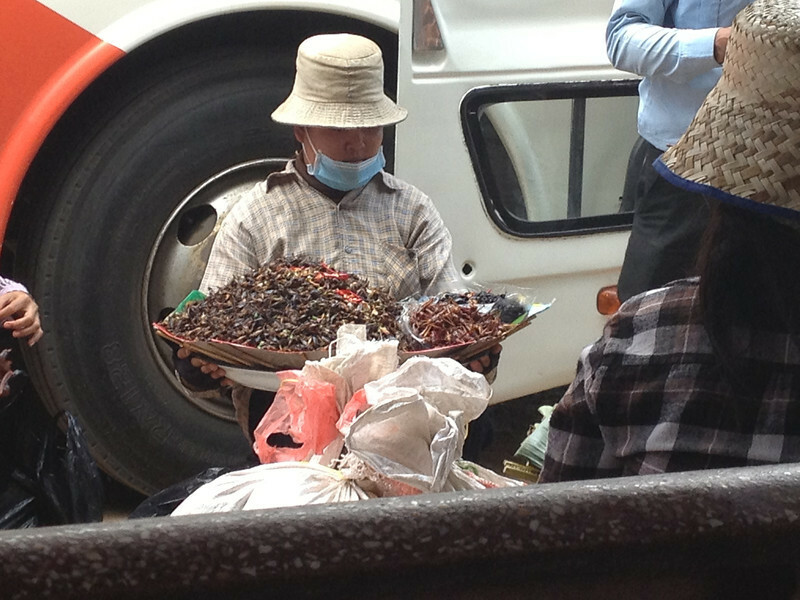 Street vendor selling fried insects. Fried birds. No, I didn’t eat this either. We left Battambang feeling much more relaxed and our bus made it to Poipet without incident. We were told that the bus would first stop at the bus station and then continue on to immigration. This was wrong. Our bus stopped at the station and that was it. Nobody would tell us how to get to the actual border. Everyone just stared at us and shrugged their shoulders. Motorcycle taxi drivers kept stopping to see if we wanted a ride but our bags were large and I just didn’t want to ride on the back with such a heavy pack. So we walked and we walked under the scorching midday sun. The handle on Micheal’s wheelie bag broke and he was forced to drag it along by a strap. Every two minutes, we were harassed by another motorcycle taxi driver who did not understand why we would not use them. I have never been more happy to see an immigration office in my life. The actual border crossing was hassle free and it was easy to book a mini bus back to Bangkok once we were on the Thai side. The mini bus dropped us off at Victory Monument in Bangkok where I quickly found a 7-11 and drank a large Thai iced tea. 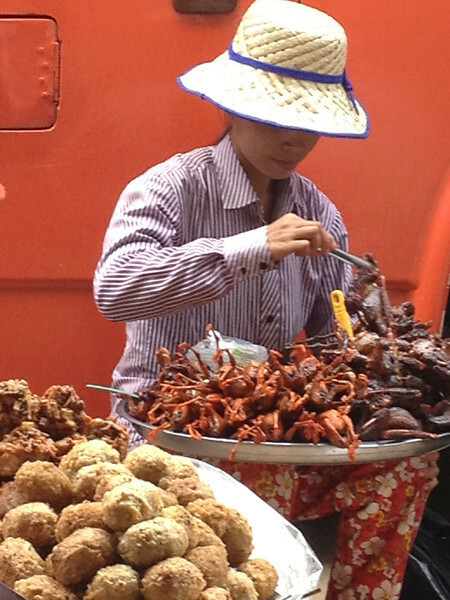 Our trip to Cambodia gave us a new appreciation for Bangkok. Now the streets look cleaner, the air feels cooler and the tuk tuk drivers are less aggressive. This might be home for a while. We’ve been keeping a secret. . . I didnt have a chance to go to Battambang, but I was told it was nice for a day or 2. You should have tried some insects! They are surprisingly not too bad!